We just want to take this chance to say THANK YOU – to all of you – whether we know you personally or just through this blog. We need you – you are our comfort blanket – you are the people who cry with us – who laugh with us – who pray with and for us. You are the ones who feed Chrissie and her family when she can’t – who watch the other kids – who step in to do those little things that no one thinks to ask for help with but which still need to get done. You are our support system. This is a long and difficult journey and we couldn’t make it without ALL of you. Recently our local newspaper, the Sacramento Bee, published an article spotlighting the long-term side effects of cancer treatment. In the article, Emily’s own Nurse Practitioner from U.C. Davis, Kay Wells, discussed the risks pediatric cancer patients may face down the road. When children are diagnosed with cancer, families fight so hard for them to make it; their lives are a gift. But the miraculous treatments that save childhood cancer patients can also, years after the fact, make them susceptible to secondary cancers and other health problems, a range of illnesses known as late effects. Now researchers are learning that those late effects can include not only the early development of the illnesses of old age but also the premature onset of frailty – the kind of physical weakness, exhaustion and low muscle mass seen more commonly in people of advanced age. 80 percent of adults who beat cancer as kids have a chronic, perhaps life-threatening health condition by the time they reach age 45. More than half have heart abnormalities by that age. Another 65 percent have impaired lung function, and 48 percent have memory impairment. Those are dismal words to read. But it’s not the first time we’ve heard them. 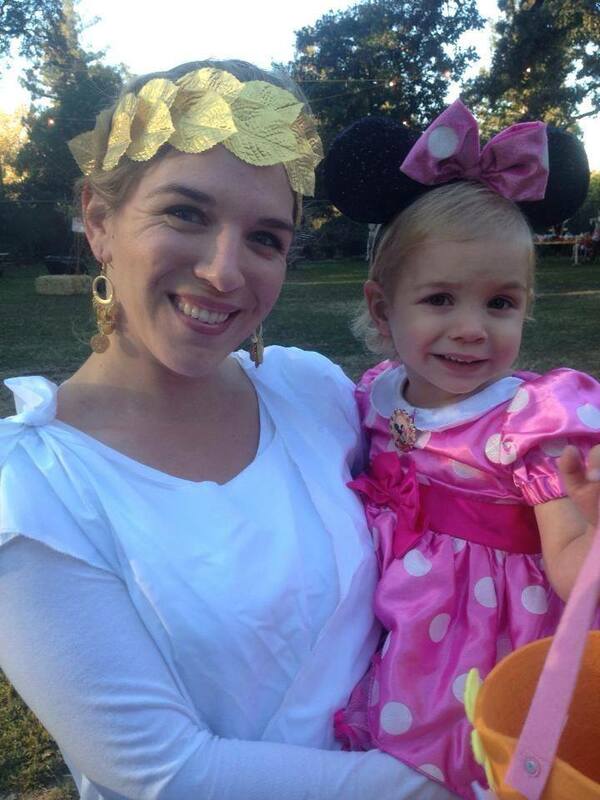 When Emily was initially diagnosed, she was given a 90%-99% 5-year EFS prognosis. That dropped to 65%-80% after her CNS-2 (spinal fluid leukemia) was discovered and she didn’t respond to the Induction Phase as hoped. Relatively speaking, those are still good odds, especially when you factor into account all the prayer being poured out over Emily everyday. We are still expecting a 100% cure. But something that’s weighed on my mind ever since first hearing those statistics prompted me to ask Kay Wells about them earlier this year. I asked, “What does 5-year EFS really mean?” EFS stands for Event-Free Survival. Tack on the “5-year” and what you’ve got is a 65%-80% chance that Emily will remain event-free (no death, relapse, or development of a secondary cancer) for 5 years. So the next question, “Well, what about after 5 years? What then?” Because I’ve looked at the statistics online, I’ve studied all the published journals and clinical trials and research I can find, and from what I can understand, the numbers don’t get better -they get worse. 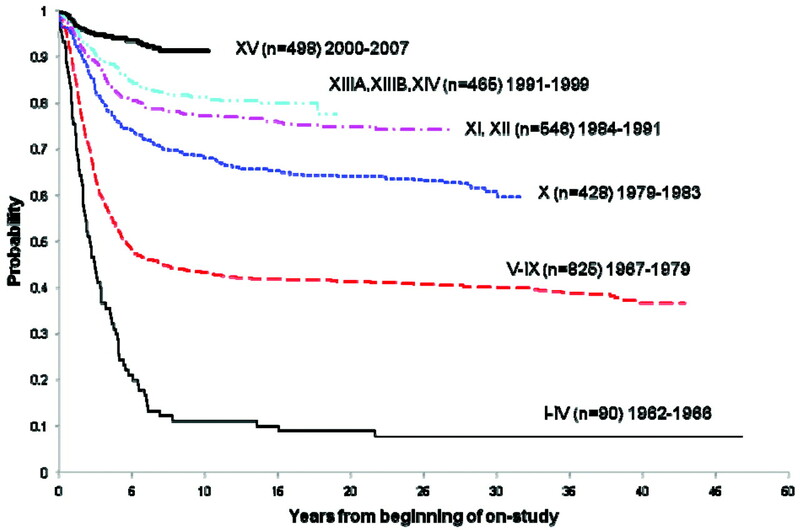 Overall survival graph This graph shows the wonderful advancements in treatment, because you can see the vast improvement of cure-rate from 1962, when only 10% of patients lived beyond one year, to the present, when more than 90% of patients live five years. However, if you look at the top line, the thick black one, which showcases more recent patients (2000-2007), you’ll see that the overall survival rate, while better, still declines with time. This is what was discouraging me earlier this year that I had to ask Kay about. 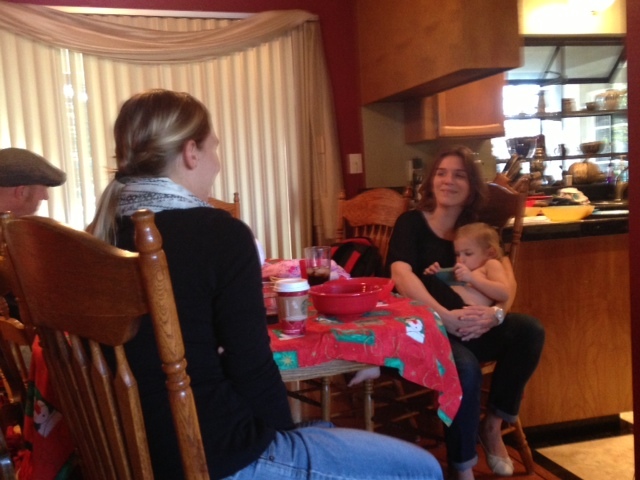 She was very straightforward with me and said that yes, Emily will most likely face challenges down the road. However, we won’t know what they are until we get there, so there’s no use worrying now. She reminded me that we’re still trying to get Emily through treatment and to focus on that. She, and Emily’s team of doctors and nurses, are monitoring Emily closely to watch for any signs of problems -not just a relapse, but cognitive delays, growth delays, heart, lung, and liver problems, and so on. And they will continue monitoring her for the rest of her life. 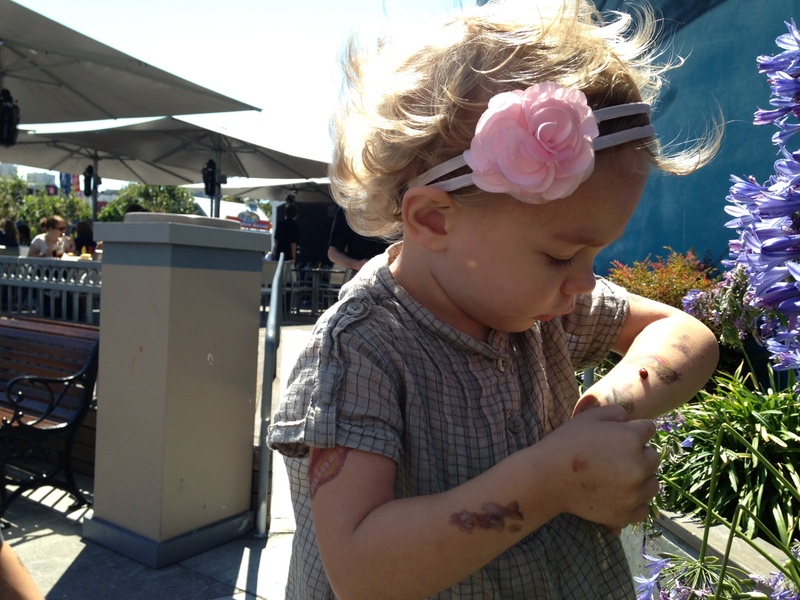 Right now we have a little girl, a lovely, blessed, spirited little girl. We can snuggle her and tickle her and hug and kiss her. We can hear her laugh and sing and sass back. We are thankful for every single moment with her, and we cannot waste one second worrying about what the future may, or may not, bring. We will just keep praying. Praying she will be free of leukemia and suffer no long-term side effects. Because I know our God is bigger than statistics. 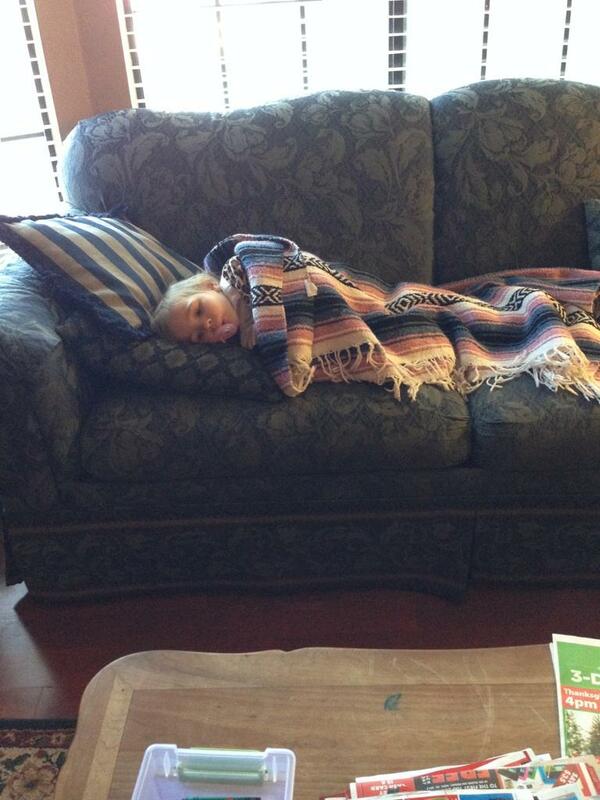 Would you pray with us for Emily’s long-term health? This blog post is long overdue – it’s been over a month since one was written – and people have been asking how Emily has been doing – and this blog was originally started to keep all of Emily’s family and supporters up-to-date on her leukemia treatment progress but, to be honest, these blogs are hard to write. You want to be informative, but not dry – you want to show the emotional side of this journey, but not get sappy – you think about it frequently but then life gets busy or you get a cold or go on vacation or just plain put off writing a post because it’s hard and “you’ll do it tomorrow.” So, our apologies and we’ll try to be better in the future! P.S. You also want to try to not have a post be too long but this is your warning that this post will probably be just that, too long – sorry —! So, I/Grammie will start with the “catching up” – Emily has been busy, which means she’s been overall feeling well enough to be busy. Thank you, God! In October we went to a local pumpkin patch where she thoroughly enjoyed getting lost in the corn maze then picking out about a hundred “perfect” pumpkins. 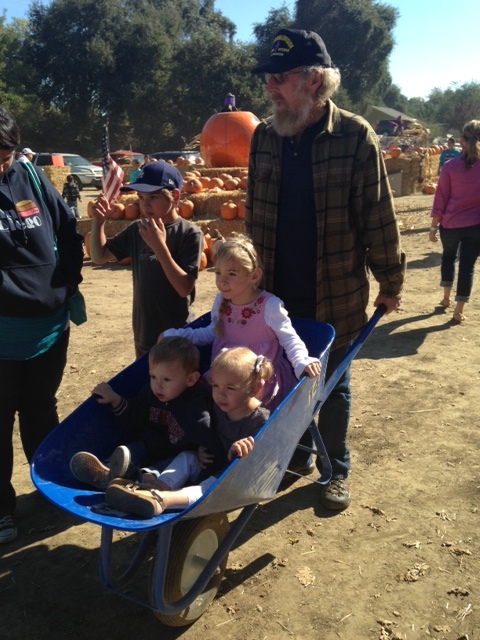 At the pumpkin patch to pick out their pumpkins. October 26th was the First Annual Emily Love Softball Invitational, held to raise funds for Children’s Miracle Network (we’ll have a separate post on that soon). Please, if you ever think about supporting an organization, support Children’s Miracle Network. Prior to Emily being diagnosed with leukemia, I/Grammie just thought of CMN as another of those charity organizations that raised money and probably used most of it for promotion and very little for the actual kids who needed the help. I was so so wrong. Emily’s leukemia treatment at U.C. Davis is supported by CMN. They provide Christmas parties – special days held at U.C. Davis, like the day when NASCAR came with their race cars, just for the sick kids – Halloween parties, like Boo at the Zoo – all kinds of stuffed animals and fun times on the actual Pediatrics and ICU units – funding for research that the hospital can’t provide -they pay for the vital Child Life program -and the list goes on and on. CNM is made up of people with big hearts and untiring dedication to these kids and their families – for the reality is that the whole family, in a way, has cancer. There are days with Mommies and Daddies not home and/or not emotionally available because they are dealing with their sick son or daughter – days, and nights, being traded from house to house so that their parents can be at the hospital – days of tension in their homes – always worrying about who might have a cold coming on and trying to keep Emily away from that person – the whole family loses and has to find a new normal. Chrildren’s Miracle Network helps to fill in some of those gaps and they are – and have been – indispensable to these families. Emily, watching Daddy play one of his softball games. 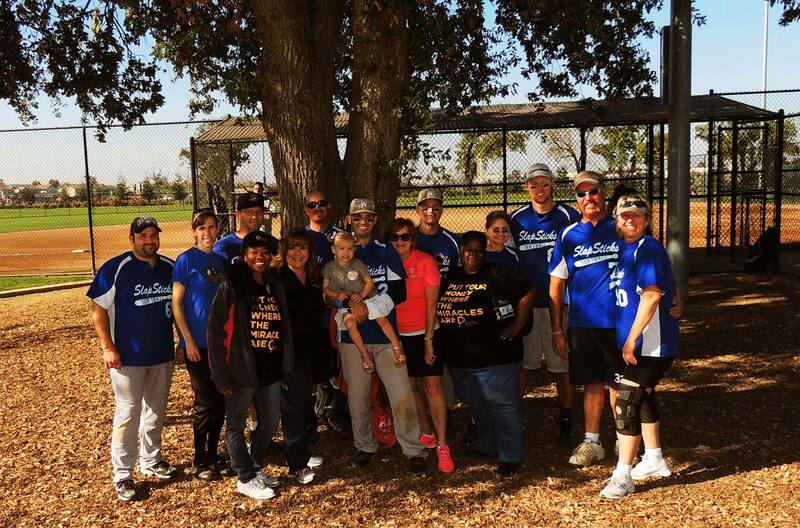 Daddy’s softball team, and some of the Childrens Miracle Network volunteers. 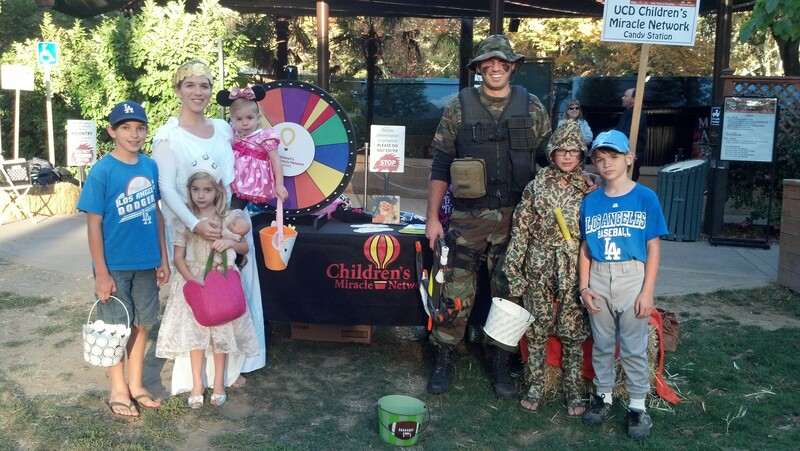 Also in October, Emily and her family attended Boo at the Zoo, and helped man a booth sponsored by the Children’s Miracle Network at the Sacramento Zoo. Emily continues in the Maintenance Phase of her treatment. She has now “graduated” down to one spinal tap every three months – she still receives monthly chemo and immunoglobulin antibody infusions – and she still gets daily chemo pills, which Chrissie grinds up in a spoon, mixes with a little water, and Emily then slurps it out of the spoon. She is on steroids for a five-day stretch each month – we just call her “steroid Emily” and wait out the hunger and the silent tantrums – and the not-feeling-so-good for the week. So far, her spinal tap results have all been clear of leukemia cells, and that is good! 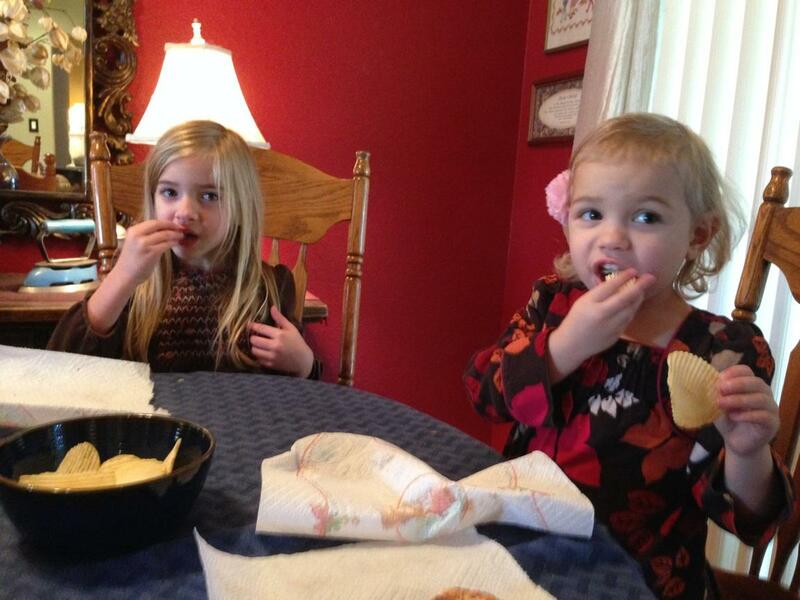 On Thanksgiving Day, our home (Grammie and Bapa’s) was filled with family – grandparents, parents, brothers and sister, aunties and uncles, and cousins. It was wonderful and busy and LOUD and awesome! The day after Thanksgiving, Chrissie and Jason and the kids – along with Auntie Gaby – went to The Galleria Mall to do gift wrapping in order to raise money for Children’s Miracle Network. For those of you in the Sacramento area, this “service” will be available through most of December. Many of the stores in The Galleria were raising money for St. Jude’s Hospital for Kids – by asking shoppers if they’d want to round their purchase price up to the next dollar to give to St. Jude’s. At one store, Build-A-Bear, a very wonderful shopper decided to donate money for a kid with cancer/or other illness to be able to make their own bear. The shopper behind her also volunteered to do it – as did many many more shoppers in that line. Over $500 was given to the store on a gift card! 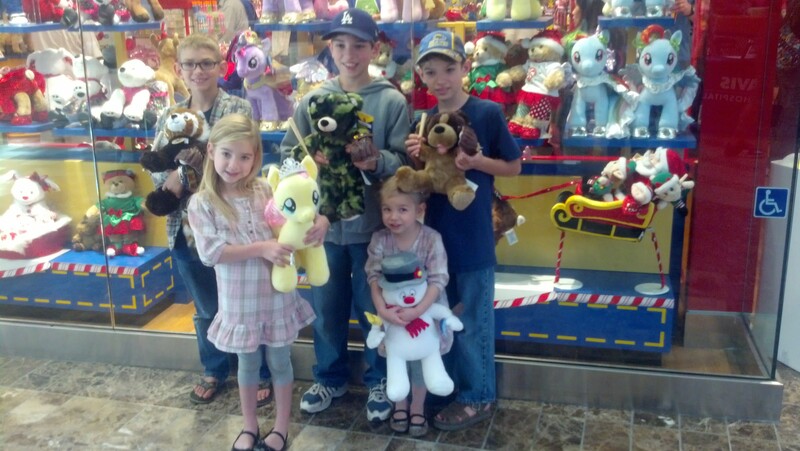 Somehow or other, the store found out that Emily was there, “helping to wrap gifts,” and a bit of the money was given to Emily and her brothers and sister so that they could each build a friend at Build-A-Bear. As I said earlier, a lot of attention, as it should be, centers around the kids who have cancer but the rest of their families are also dramatically affected – so Childrens Miracle Network was awesome to include all of Emily’s siblings in the donation. Friday night found the Love’s with Jason’s side of the family, where they all enjoyed a post-Thanksgiving game night. Jason and Chrissie are so thankful to have both their families in town. On Saturday, today, Chrissie and her sister, Jennifer, were both here (at Grammie’s house), prior to Jennifer and her family driving back to Tulare (south of Fresno and way too far from home – just sayin’) later in the day. As they were visiting, I was listening to my daughters discussing cancer and the other families and kids whom Chrissie has come to know through this journey and the sadness as a few of the children have died – and the hope as others have successfully completed their treatments. I overheard them discussing the dedication of the nurses at U.C. Davis. (As an aside, I ask you to pray for the nurses and staff at this hospital – because they are intelligent, capable, loving people who have dedicated their lives to taking care of these kids – yet they are constantly having to deal with the stress of seeing new, sick kids and their shell-shocked families whose lives have just been turned upside-down – and of having to say good-bye, either at funerals of kids who have passed on or happy good-byes to the kids who have successfully completed their treatments. These nurses pour their hearts and souls into caring for these kids – and their families – and they could use all of the prayers that you could send their way.) Chrissie and Jennifer didn’t “solve” anything, but it always helps to talk through the stress and strain. Sisters talking – with Emily, who wasn’t feeling very well, at the time. 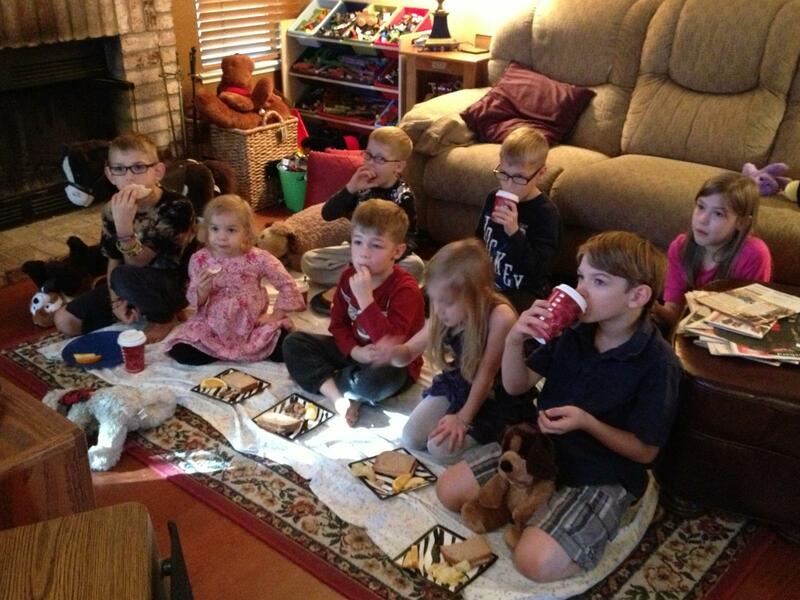 Eight of the grandkids watching Grammie’s favorite Christmas movie, “The Night They Saved Christmas!” Finally, someone new to coerce to watch it!